Private tuition with experienced Lincolnshire pyrography artist Susan Robey now available. Beginners and improvers aged sixteen years and over welcome. Courses and themed workshops designed to accommodate all levels of ability. Enjoy learning and developing at your own pace in a relaxed environment. Choose to attend as part of a small group or on a one to one basis. 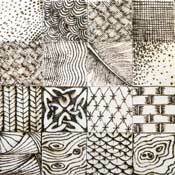 Susan has an extensive knowledge of the subject, having specialised in the medium for over thirty years. Her aim as tutor is to guide, inspire and bring out the creative side in everyone. Artistic ability is not essential as a selection of designs will be available. All courses and workshops are six hours in duration taking place from 10.00 am to 4.00 pm in Susan's own studio. Quality individual tuition is guaranteed with a maximum of three students on any day. Cost includes all private tuition, use of equipment, materials and unlimited refreshments throughout the day (excepting lunch which is to be provided by the student). Ideal for the beginner, this one day course provides a full introduction to the art of burning designs on natural materials, focusing on wood and leather. Students leave with finished pieces in both these materials having acquired a sound knowledge on which to base their future development. To read testimonials and see more examples of work produced by students who have attended the course, please click here. Should you be interested in an introduction to this craft but unable to attend a course, there is also an instructional DVD available. For more information and to make a purchase, please click here. Alternative mutually agreed dates at the group rate can also be arranged for couples who wish to attend together. Take your pyrography to the third dimension on this themed full day workshop where wood will be your canvas. 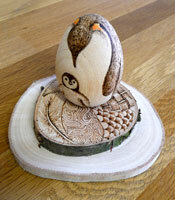 Create your own "Egg-ceptional" piece on a turned wooden egg or choose from a variety of other turned wooden objects. Working on a curved surface presents a unique challenge. On this workshop you will learn all the tips and techiques, create three dimensional designs and experiment with a range of suitable colouring mediums for even greater effect. Designed to accommodate all levels of ability including those new to pyrography. A mutually agreeable date for individuals or couples may also be available for this workshop on request. All private tuition takes place within the UK at Susan's studio off the A1434 Newark Road in the town of North Hykeham approximately four miles south of Lincoln city centre. Why not combine with a short break in the area and visit the historic Lincoln Cathedral and Castle or explore the surrounding countryside? Please contact Susan direct for further details and/or how to book your place.